Stephen and Bloom grew up in the foster home system which is another way of saying they had each other. Together they discovered the art of the con. Stephen is the mastermind that writes the cons with flair and Bloom is the vulnerable anti-hero sent in to get the girl. Bloom quits after a dangerous night in Berlin and moves to Montenegro. Shortly after, Stephen finds Bloom and talks him into one last con. The perfect con. And so begins the tale of Penelope. Rian Johnson deserves an Oscar. The guy has made 2 films in his career and both of them have been made with more talent and care than 90 percent of anything else that's come out this decade. His first film was a gritty, neo-noir tale that took place in an American high school. 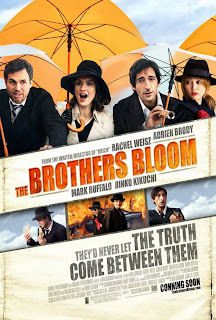 The Brothers Bloom is about two anachronistic brothers that have made the art of the con their family business. Did I mention he's also twice as gutsy as any writer out there? There is so much that this film does right that I'm having a hard time picking out a starting point. Let's start with the writing. This film is deeply moving, hilarious, intelligent, cheeky and most importantly tells a fantastically twisty story that was meticulously crafted. I won't say much outside of that as it would be a shame to throw you into spoiler territory. After all, what's a con movie without the big finish? The dialogue is witty and crisp and the actors deliver their lines with awesome 1940's sensibilities. Secondly, the look of the film is just cool. It has this really neat over-saturated look that allows Johnson to really play with the brilliant color scheme. Not to mention the camera work is great and deftly planned. Every single actor is on top of their game here but Rachel Weisz really steals the show as the quirky, yet accessible Penelope. And Adrien Brody is at his melancholy best. The Brothers Bloom was one of my most anticipated films of the year and for good reason. My expectations were astronomically high and they were exceeded. Rian Johnson is a director to watch and I hope he starts getting more recognition very soon. My advice is to make way and make room for the Brothers Bloom!